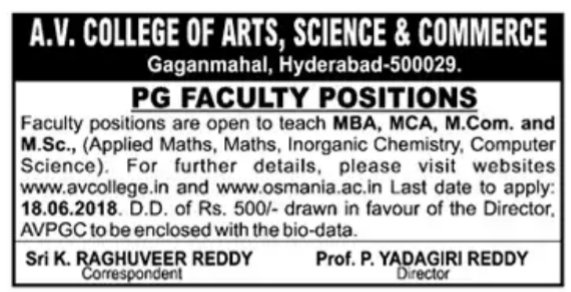 A.V College of Arts, Science and Commerce, Hyderabad, has advertised in the Hindu newspaper for recruitment of Teaching PG faculty jobs vacancies. Interested and eligible job aspirants are requested to apply 18.6. 2018. Check out further more details below. 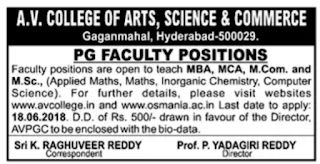 Name of the College :A.V College of Arts, Science and Commerce, Hyderabad. How to apply: Interested and eligible candidates are requested to view for further details please visit website www.avcollege.in and www.osmania.ac.in. Last date to apply:18.06.2018 D.D of RS.500/- drawn in favour of the Director, AVPGC to be enclosed with bio data.